We spend our lives doing all we can for our families, but often at the end of our lives, we leave them with a great burden – having to settle our estates. Everyone knows they should have a Will, Power of Attorney and other legal papers in order. But, there are a lot of other things you may not think about. Just having your Will in their hands doesn’t help your family to know what to do or whom to contact. Without a list of all your information, your family will have to pore over any paperwork they can find in your home and try to piece together whom they have to contact and notify about your death. It’s important that you make a list of every company you have an account with, such as cable or satellite TV, electric, water, garbage collection, house and car insurance, etc. Include the names of the companies, their addresses, phone numbers and your customer account numbers. Also, list all bank accounts, investment accounts and your pension and Social Security information. If you are collecting Social Security or other pensions, be sure your family knows these are the first ones that need to be notified immediately. 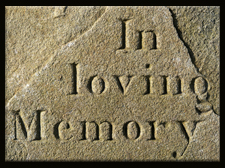 Any payments sent or deposited into your account after your demise, will have to be re-paid from your estate. You might want to consider adding a family member’s name to all your accounts, including your car title and especially your bank account. Each state has their own rules, but many banks will not just accept your executor’s word and a photocopy of your death certificate. Banks often require a ‘certified’ copy of the death certificate, which your family has to order through the funeral company and pay a fee for. This can take a week or more to receive. In the meantime, your family has to pay your bills and expenses out of their own pockets, if no one else’s name is on your bank account. Check with your house and car insurance companies to find out their policy on what happens at your demise. Will they continue to insure your house and car until they are sold by your family? Talk to a financial adviser or lawyer if you have an IRA investment that you will be leaving to your children. An inherited IRA can be difficult to deal with. They cannot be simply cashed out by your children without paying approximately 25% in taxes. Other inherited money, pensions, stocks and bonds are tax-free, but not IRA’s. If you have particular belongings that you want to go to certain family members, be sure to write it all down and have a copy stored with your will or your executor. Better yet, give copies to all your family members who will be inheriting. That way, they know your wishes and there are no surprises for them when the time comes. No matter how much you might think your children are sensible and will divide everything up between them, you wouldn’t believe how much people can change when it comes to settling an estate, especially while grieving. Be sure your family knows your wishes when it comes to your burial arrangements. Do you want a traditional burial in the cemetery? Do you want to be cremated? If so, what do you want done with your ashes? It’s best to have it all down in writing, even better to have it written into your will. When my mother passed away, we went to the funeral home and we were surprised to find that she had already made all the arrangements for her cremation and ashes burial. She had ordered her headstone, and paid for everything. She had even written her own obituary! We didn’t have to agonize over making these types of decisions. Take a few minutes to sit down and think about who you would want your family to notify – your friends? Doctors? Dentist? Magazine subscriptions? Email contacts? Make a list of all these for your family including names, addresses, phone numbers and emails. This can be an uncomfortable subject to think about, but you will be doing your family a great favor by helping them to be prepared. You don’t want to be a burden to anyone now; why be a burden once you are gone?